(Reprinted with permission) Baseball helped U.S. District Court Judge Juan R. Sanchez, of Philadelphia, make friends when he moved from Puerto Rico to New York City at age 12, and it was the inspirational example of Roberto Clemente that ignited his passion for public service. Today, Judge Sanchez plays baseball in the Men’s Senior Baseball League and follows his granddaughters’ little league games. He is featured in the latest installment of the federal courts’ video series Pathways to the Bench that highlights judges who have overcome personal challenges on their way to serving in the judiciary. In these four-minute profiles, they share with young people some of the life lessons they have learned through adversity. Click on the link ‘Pathways to the Bench’ above to view a video outlining Judge Sanchez’ journey. Below is a recent conversation we had with the Judge. Juan Sanchez is a baseball fan. He has been one all of his life. Juan came to the United States from Puerto Rico in 1968 at the age of 12 and settled into the Bronx with his family and became an instant Yankee fan, though his understandable idol growing up on the island was Roberto Clemente. 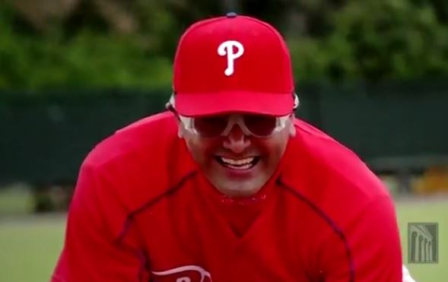 Juan currently plays in the Greater Philadelphia MSBL at the age of 62 but this story is about more than playing ball into one’s 60’s or beyond. Juan is now addressed as United States District Court Judge Juan R. Sanchez of Philadelphia. Judge Sanchez is now a second baseman in the MSBL, though he will be spending 2018 away from the diamond to follow his granddaughter’s budding softball career, one of his nine grandchildren, including a set of triplets. “I can always keep playing but I only have one chance to follow her career so I will get to as many of her games as I can. My family is very important to me so I need to seize this opportunity to be with her as much as possible. By the time I play again I’ll be eligible for the 65 and over division,” chuckled Sanchez.